It’s hard to believe, but boating season is just around the corner (at least for us Northerners). It would be great if we could just cut the shrink-wrap off, drop the boat in the water and go, but that’s generally not the way it goes, especially if you want a trouble-free season. For this edition of Boat Care, I’d like to remind you of a few pre-season checks to perform, some obvious, and some not. Of course, this list is not all-inclusive–I only get so much space–and your particular launch list will (or should) obviously be a bit fuller. The idea is to get you thinking. Let’s get ready to go boating! Engine Room: There’s plenty to work with in the engine room. The first thing to check would be your fluids, since that’s what one would do before every trip, anyway! Some might assume that since the boat was winterized it should be ready to go. Don’t fall into that trap! Look it all over: motor oil, transmission fluid, coolant, trim tab reservoir, battery corrosion. It’s better to be sure than to spend your first day out on the water fixing a problem that could have been easily avoided. Fuel System: The fuel system, too, is vital. Are the fuel/water separators new and clean? Even if they are, make sure you have spares. If condensation has gotten into the fuel tank, you’re going to need them. And speaking of filters, open up any raw-water strainers you may have on the boat to see that they’re clear of any residue or seaweed. While you’re in the bilge, open and close all seacocks to ensure smooth, proper operation. If for some reason a hose develops a leak, you’ll want to be able to shut off any inflow of water in a hurry! Following along that line of thought, check all the hoses, both for the condition (if you see any cracking or a hose feels mushy or weak, get it replaced before launching) and the clamps. The clamps should be clean and non-corroded. Inspect around all bilge pumps, including any in the cabin, for debris around the inlet. Float switches–for pumps and high-water alarms–should also be clear of anything that could hang them up and prevent them from functioning properly. Electrical System: As for the electrical system, visually inspect all battery terminals for corrosion and dirt, and clean them if necessary. Be sure they’re mechanically tight as well. As for the batteries themselves, it’s a good idea to load test them after a couple of seasons. If you’ve removed them for winter storage, it’s easy to have your mechanic evaluate them–no juice means no fun. 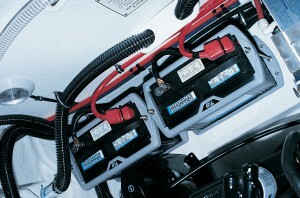 Formula uses only marine-grade batteries, manufactured to be especially tough so the pounding they go through on the water won’t result in plates breaking loose inside. If any need to be replaced, make sure you do so with a similar model, not only in construction but in cranking and storage capacity as well. 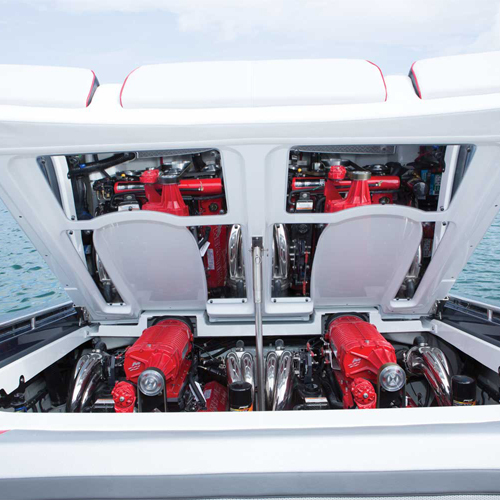 Carbon Monoxide Detectors: Fumes are bad news when it comes to boating. It’s not unheard of for a blower to fail, so turn them on and inspect all. Fuel fumes aren’t the only issue–carbon monoxide should be of concern to every boater. CO detectors and all engine exhaust systems must be in good working order. Pay special attention to generators–although many modern generators have been designed to significantly reduce CO emissions, be sure yours is running properly. Prepare the Cockpit: In the cockpit, empty all storage lockers. Lay out fluids and cleaning supplies and take an inventory; replenish as necessary. Count PFDs so you know there are enough on board, and check over the rest of your safety gear to make sure none made their way off the boat last season. Unravel dock lines and anchor rodes, and if they’re dirty or salty, give them a soak and a rinse before drying and recoiling. Cleaning house in this manner also gives you the opportunity to rid yourself of excess junk that would just get in your way. Before storing everything again, get a hose and rinse all self-draining storage tubs. This will not only clean them, but you’ll discover any clogs in the drains. 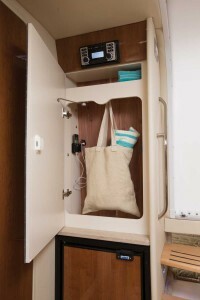 Prepare the Cabin: Go below and do the same to cabin storage areas, then get to work on the freshwater system. Pressurize to check for leaks, evacuate the RV antifreeze and flush until clear. The shower sump should be reasonably clean and working properly, as should all head components. These need attention too, so be sure that pumps are running and valves are sealing before the boat leaves the dock. Well, that’s a good start, but I would encourage you to put together your own custom checklist to use year after year. Include all the procedures here that pertain to your Formula and add others that are necessary. After getting to know your boat for a few seasons, I’m sure there’s plenty you’ll be able to add. Here’s wishing you a happy–and prepared–boating season this year!